ChildChild age: 6-12 years. Under 6 ride free. Please confirm the line item for the specific time of the tour. Caliope concert 15 minutes prior to cruise boarding times. 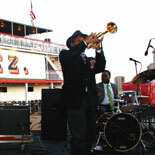 Come aboard and enjoy New Orleans hospitality ... Steamboat Style! This two-hour narrated cruise takes you back when cotton was king and life was slow and graceful as the current on the Mississippi. The Steamboat NATCHEZ will show you New Orleans, one of the world's most active ports, as it can best be seen from the river. 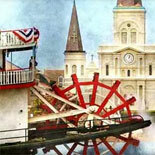 Recommended by the New Orleans Convention and Visitors Bureau. 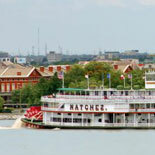 Get your eTicket today and cruise the Mississippi River on New Orleans' only authentic Steamboat...The Steamboat NATCHEZ! Experience Southern Hospitality, Steamboat Style! Closed July 4th Christmas Day, Thanksgiving Day, Mardi Gras (Feb 13) and Mother's Day. Annual Maintenance: Jan 21-Feb 8, 2019.-NO CRUISES. Reservations are required. Please confirm the line item for the specific time of the tour. Steamboat Natchez "Lighthouse" Ticket office located at Toulouse Street and the Mississippi River. Pay parking is available by ticket office. Child Ticket: 6-12 years old. 5 and under ride free with paid adult.